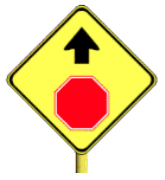 In this practice test you will be required to answer all 51 questions about traffic signs from the Driver Knowledge Test Question Bank. Not drive beyond the sign. Traffic travels in each direction. You may turn to the right. 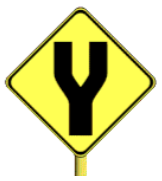 You must give way to traffic on your right. 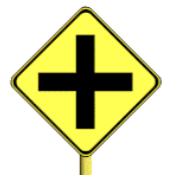 You may travel only in the direction in which the arrow is pointing. One lane bridge ahead, slow down. You are not to exceed 60 km/h. You can go faster than 60 km/h. You are on Highway 60. You must not drive faster than 100 km/h. You must drive faster than 100 km/h. The sign applies to truck drivers only, cars can travel at any speed. Drive carefully, and watch out for kangaroos entering the road for the next 30 km. Nature reserve 30 km ahead. No through road ahead, slow down. Tollway ahead, be prepared to stop and pay toll. 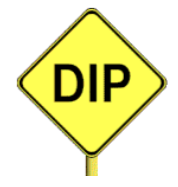 On the approach to a bridge which has room for only two vehicles, slow down and proceed with caution. Road may be slippery when wet, slow down and drive carefully. Road under repair, drive carefully. As you approach a winding road, slow down and drive with caution. If there is a steep hill ahead. If an unsealed road is ahead. A sharp depression in the road is ahead, be prepared, slow down. Do not drive with your lights on high beam. Sharp bend to the right ahead, slow down and drive carefully. 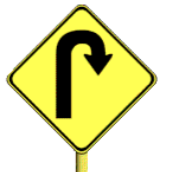 Turn around and go back, you are going the wrong way. 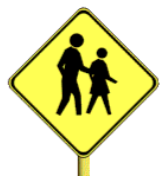 Children may be crossing the road ahead, slow down and be prepared to make a safe stop. There is an athletic field ahead. 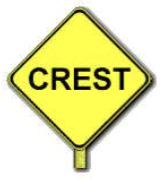 Crossroads ahead, reduce your speed and watch out for other traffic and pedestrians. Stop until red lights stop flashing then drive on if it is safe to do so. Slow down and drive carefully over the crossing if you cannot see a train approaching. Stop until train has passed then proceed immediately. 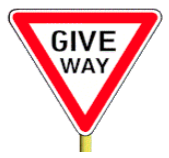 A give way sign at an intersection is ahead, slow down and be prepared to stop. You are approaching a school or playground. You are approaching an intersection with traffic lights, be prepared to stop. 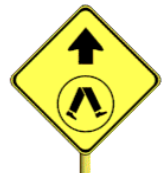 Slow down and look out for pedestrians crossing the road ahead. Hospital ahead, slow down and proceed with caution. Overhead footbridge for pedestrians ahead. 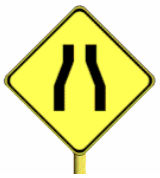 When a divided road ends and two way traffic is ahead. If a one way street is ahead. If a one lane bridge is ahead. Workers ahead, slow down and be prepared to stop. Children's playground ahead, slow down and be prepared to stop. You are approaching a children's playground, slow down. If traffic lights are out of order or the amber light is flashing, you must stop and give way to traffic as if you are at an intersection with stop signs. Stop, red light camera in operation. Stop sign ahead, slow down and prepare to stop. 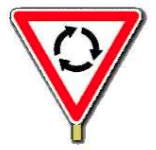 You are approaching a roundabout, prepare to give way. Traffic controller ahead, slow down and be prepared to stop. 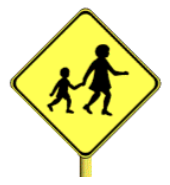 School children crossing the road ahead, prepare to stop. Traffic lights out of order, Police on duty ahead. 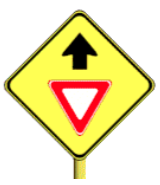 Steep down-grade in the road ahead, slow down. Road ahead slippery when wet, drive carefully. Road under repair, slow down. 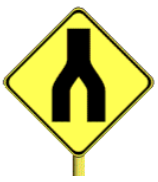 A divided road is ahead, prepare for a change in traffic conditions. 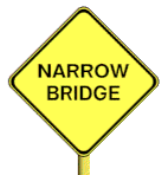 A two lane bridge is ahead, slow down and drive carefully. Freeway conditions are ahead, maximum speed is 100 km/h. 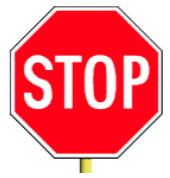 Railway level crossing with flashing signals ahead, slow down, drive carefully, and be prepared to stop. Intersection ahead with traffic lights, prepare to stop. 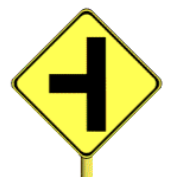 Merging traffic, give way to your right. Vehicles must not stop at the kerb, except if picking up a passenger. Vehicles must not stop at the kerb, unless picking up goods. Vehicles carrying three or more people, and motorcycles may use this lane. Motor cars carrying one passenger may use this lane. 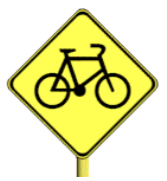 This lane is reserved for bicycle riders only. Railway level crossing ahead, slow down and look out for trains, be prepared to stop. Cattle or sheep crossing the road ahead, drive slowly. Give way sign ahead, slow down and be prepared to stop. 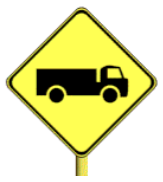 Take care, trucks crossing the road ahead. Take a break, rest area ahead. Stop at the stop line and give way to all traffic. 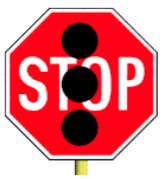 Stop at the stop line and give way to all traffic on your right only. Slow down and be prepared to stop only if there is any danger of a collision with another vehicle or pedestrian. Slow down and be prepared to give way to traffic on your right only, if there is any danger of a collision. Come to a complete stop, look both ways for trains and proceed with caution if no trains are approaching. Slow down, then drive slowly over the crossing looking both ways for trains. 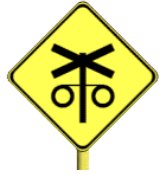 Stop, only if a train is at the crossing. Slow down, the maximum safe speed around the next curve in the road is 35km/h. Slow down and be prepared to stop if the lights start flashing, warning you of an approaching train. Continue at the same speed and not look both ways for approaching trains. Stop in the middle of the railway tracks and look both ways for approaching trains. 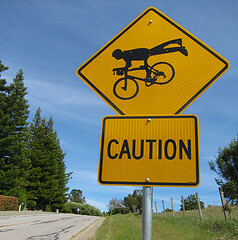 What does this sign means? You must stay in or move to the left lane, unless you are overtaking another vehicle. You must stay in the left lane and must not overtake any vehicles. You can overtake vehicles only on the left side. Slow down and be ready to stop and give way to a train. Stop before the railway crossing, wait for 1 minute and proceed if the crossing is clear. Drive quickly over the railway crossing. Slow down, be ready to stop and give way to all vehicles already on the roundabout if there is a danger of a collision. 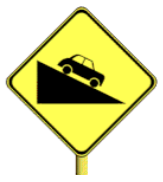 Drive carefully, you are reaching the top of the hill and will not be able to see a safe distance in front of you. Watch out, the road ahead may be flooded. Slow down, there is a dangerous curve ahead. 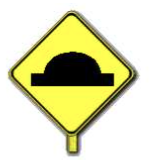 There is a hump (sudden slope up and down) in the road ahead, slow down. There is a tunnel ahead, turn on your headlights. The road ahead is closed, go back. There may be animals on or near the road ahead, slow down and be prepared to stop to avoid collision. Animals are crossing the road ahead, stop and wait for directions. Only vehicles carrying a disable person and displaying a mobility parking authority may park in this area. Motorcyclists may park in this area. Vehicles may park in this area for up to ten minutes. 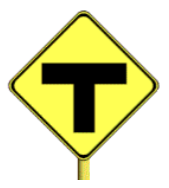 All traffic must travel in the direction of the arrow. Follow the arrow unless you are turning right. 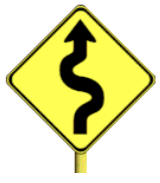 Road curves to the left ahead. Must not stop your vehicle at the kerb during the times shown. Must not stop here at any time.